The main government website on the program is at CARS.gov. 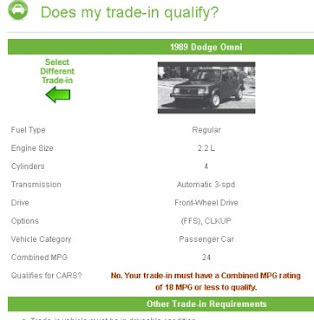 They also now have a vehicle eligibility guide page up that will guide you through steps to select your car and determine if it qualifies for trade-in for the Cash for Clunkers $4500 or $3500 incentive. This is the government source so its the best place to go to find out if your car qualifies or not. Unfortunately I haven't found a simple list of all the cars that do and do not qualify, but such a list might be harder to make than you think. For example a given model of car might have 4x4 and two wheel drive options, 4 cylinder and 6 cylinder engines as well as manual and automatic transmissions and the MPG may differ for all of the differences. So you can't just say that 1994 Ford F150 trucks qualify or not.